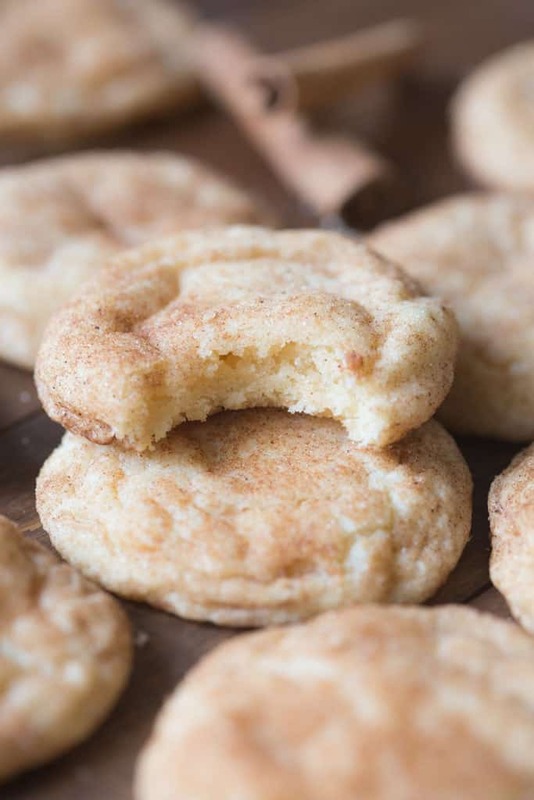 The BEST soft and chewy Snickerdoodle recipe! These get RAVE reviews every time and they are so easy to make. Hooray for Friday and the upcoming WEEKEND! We moved to a new house this past week and I’m exhausted! Our house is still in the same area, but moving just isn’t easy, no matter how far you go! My kitchen is finally put back together so I think that calls for some fresh baked cookies. I wanted to share a “classic” cookie recipe with you guys because, let’s face it, more often than not I’m making favorite easy Chocolate Chip Cookies, or snickerdoodles in my “real” everyday life. There’s a time and a place for fancy Turtle Thumbprint Cookies or Chocolate Nutella Sandwich Cookies, but everyone loves some good old fashioned Snickerdoodles! Snickerdoodles are a type of cookie that are known for being soft and chewy. Snickerdoodles are made with butter, sugar, shortening, eggs, vanilla, flour, cream of tarter, baking power, and salt. 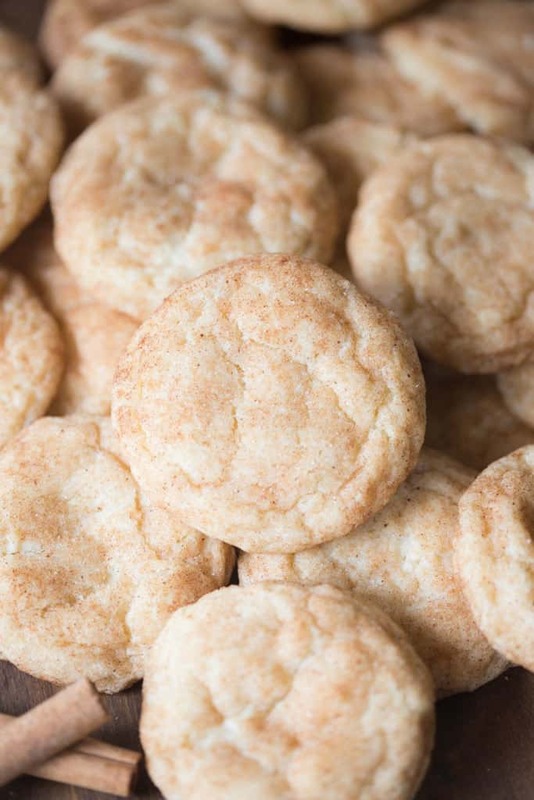 The cream of tarter is important in providing the unique snickerdoodle taste and also in giving the cookies a chewy texture. 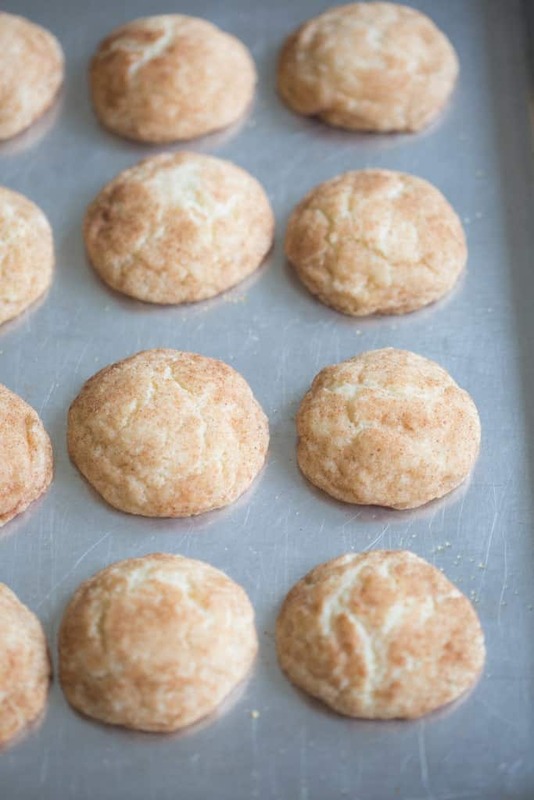 Most importantly, snickerdoodles are coated in cinnamon and sugar before baking in the oven! The ingredients for these snickerdoodles are ones I always have on hand, and they only take a few minutes to make. 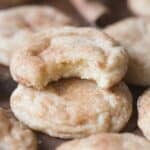 Cream of tarter is important in this recipe because it helps distinguish the taste between a butter cookie and a snickerdoodle and helps with that nice chewy texture. Snickerdoodles are one of those cookies that I only like when they’re homemade. When you buy them from the store they’re always flat and crunchy, which I hate! I love them thicker, with a tiny bit of crisp on the outside and a super soft and chewy inside. I’m here to tell ya, this recipe is a WINNER! I recently sent a bunch to work with my husband and you would have thought people won the lottery with what a bit deal they made over these delicious snickerdoodles! Start by creaming the butter, shortening, and sugar. Then add the eggs and vanilla and mix well. Add the dry ingredients next and stir until combined. Now you are ready to shape the snickerdoodles into small balls. Finally, roll the snickerdoodle dough in cinnamon and sugar and bake them in the oven! The snickerdoodle dough can be sticky and tough to handle. I like to grease my hands with cooking spray so they are easier to handle. Also, after you have rolled one tray of snickerdoodles, place it in the refrigerator for a few minutes. This will make it easier to roll them in cinnamon and sugar before baking! 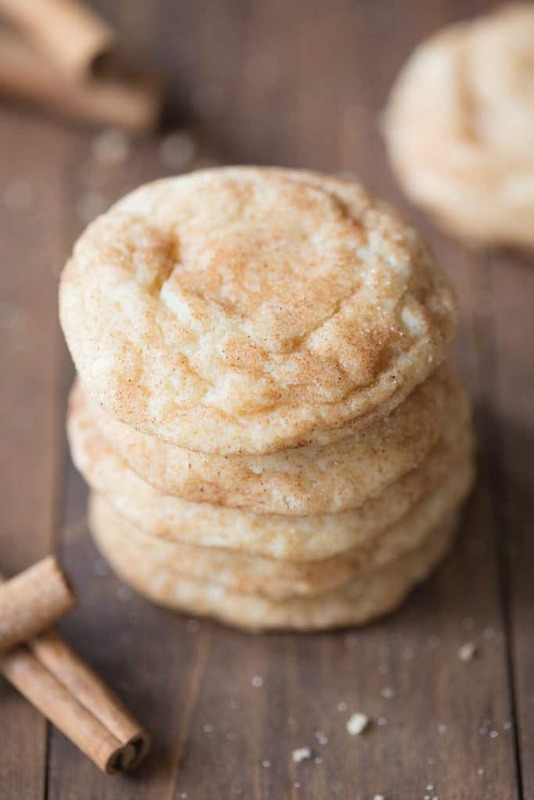 The BEST soft and chewy Snickerdoodles! These get RAVE reviews every time I make them! Cream together butter, shortening, and 1 1/2 cups sugar. Add eggs and vanilla and mix well. Add the flour, cream of tartar, baking soda and salt and stir until combined. Shape dough by spoonfuls into balls. I grease my hands with cooking spray since the dough is slightly sticky. I also like to put one finished tray of rolled cookies in the fridge while I"m rolling the second. Then when you're ready to roll them in cinnamon and sugar they are easier to handle. In a separate bowl, mix the 4 tablespoons granulated sugar and the cinnamon. Roll balls of dough in mixture. Place dough about 2 inches apart on a parchment lined baking sheet. Bake 8 to 9 minutes (don't over bake!) Remove immediately (and carefully, with a good spatula!) from baking sheets onto a cooling rack to cool completely. When I was little, my Mom bought me a cookie recipe book. The page with these on it was well worn. I decided to make them to day and looked up the recipe on line. There were many but none like these. I remember the cream of tartar. This recipe is the exact same one I lived as a kid. They were perfect. Best ever Snickerdoodles. My friends and sister loved the cookies. They stayed fresh for a long time. I thought the cookies were too sweet, but everyone else loved them. Thanks for the recipe. I love this recipe! I didn’t have any shortening so I used another half cup of butter and ran short of flour and had to use half a cup of almond flour but they turned out great. I don’t know if it was my substitutions or a lower oven power but I had better results leaving my cookies in an extra three minutes. I like my snickerdoodles to be a bit crispier than most other types of cookies. After the first batch, the one that I baked for 8 minutes, had sat a while on the hot cookie sheet they were fine. I highly recommend this recipe! I’ve never made snickerdoodle cookies before and now I can’t wait to make this again!! I had binge watched hours of the Great British Bake Off and really wanted to bake something! Found this recipe! These cookies were the first thing I EVER baked from scratch! I shared them with lots of friends and coworkers and they all said they thought they were store bought!! I love this recipe, and even though I’m just twelve, I make it at least once a month! I actually make it without cream of tarter, and instead of rolling it in sugar and cinnamon, I roll it in powdered sugar. Either way, they are delicious! ?! Snickerdoodles are my boyfriends favorite cookies. I surprised him one day and brought these to him. He told me they are the best Snickerdoodle cookies he has ever had. I will continue to use this recipe! They were simple to make and taste amazing! Yes, they freeze great! Enjoy! My husband said, “whatever recipe you’re using, keep baking them because these are delicious!” 🙂 Everyone loved them! Thank you!! !